For a video version with data updated through 2016, click here. 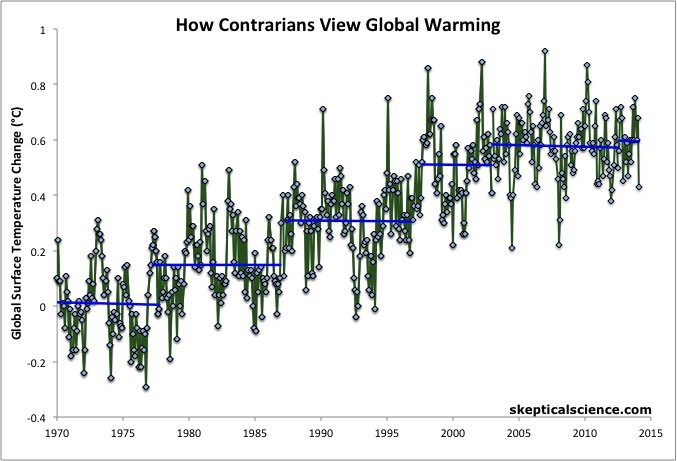 One of the most common misunderstandings amongst climate contrarians is the difference between short-term noise and long-term signal. This animation shows how the same temperature data (green) that is used to determine the long-term global surface air warming trend of 0.16°C per decade (red) can be used inappropriately to "cherrypick" short time periods that show a cooling trend simply because the endpoints are carefully chosen and the trend is dominated by short-term noise in the data (blue steps). Isn't it strange how six periods of cooling can add up to a clear warming trend over the last 4 decades? Several factors can have a large impact on short-term temperatures, such as oceanic cycles like the El Niño Southern Oscillation (ENSO) or the 11-year solar cycle. These short-term cycles don't have long-term effects on the Earth's temperature, unlike the continuing upward trend caused by global warming from human greenhouse gas emissions. The data (green) are NASA GISS monthly global surface temperature anomaly data from January 1970 through December 2014, with linear trends for the short time periods Jan 1970–Oct 1977, Apr 1977–Dec 1986, Apr 1987–Oct 1996, Aug 1997–Dec 2002, Jan 2003–Jun 2012, and Jul 2012–Feb 2014 (blue), and also showing the far more reliable linear trend for the full time period (red). Note: the concept of the Escalator (as well as the term 'going down the up escalator') was first proposed by Bob Lacatena. Does the global warming 'pause' mean what you think it means?